These valves have a thermostatic head on them often with numbered increments. They react to the air temperature around them to control the comfort level of each individual room. They do not operate the boiler, they just control the radiator they are fitted to. 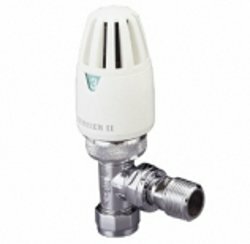 It is best to set these valves at mid-range then leave the room for a couple of hours then return and see if you feel comfortable. If the room temperature is not right adjust the valve one digit then leave for a couple of hours. Repeat the process until you find the right setting. Note of caution, these valves will shut down prematurely if they are positioned behind long curtains or where there is no clear air space around the head. 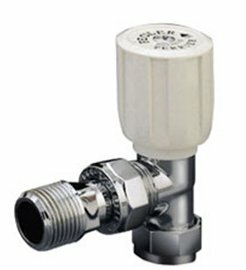 This valve is simply an on/off valve which you should be able to turn by hand. This valve is usually the same as the wheelhead valve (although not in every case). 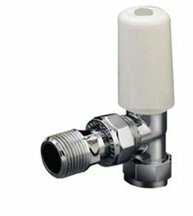 It has a smooth plastic cover on top which has to be removed so the valve spindle is exposed. This valve can be closed for purposes of removing the radiator but is generally used to adjust and restrict the flow of water from that radiator to increase the flow through other radiators, this process is called balancing the system.